Two years ago, more than 180 countries came together to sign the landmark Paris Agreement to fight climate change. It was a moment many hoped would keep global warming below 2 degrees Celsius and put the world on a more sustainable path. Heads of state and other leaders will again unite in Paris on December 12 for the One Planet Summit to affirm their commitments and find tangible ways to achieve them. The climate clock is ticking. Global temperatures have already increased by over 1 degree Celsius since the pre-industrial era. Carbon dioxide levels are at their highest in 800,000 years. 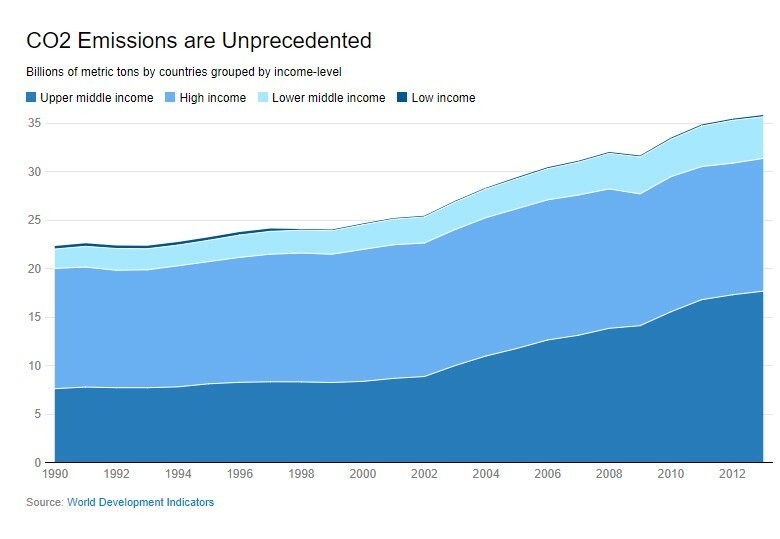 After three years of leveling off, global emissions have begun to rise again. Recent record-breaking storms and flooding linked to climate change have claimed lives, devastated communities, and destroyed infrastructure from the Caribbean to the South Pacific, Africa and South Asia. Such events, along with droughts, sea rise and other climate-related impacts, could push an additional 100 million people into extreme poverty by 2030. Meeting the Paris climate commitments will require investments at an unprecedented speed and scale. Over the next 15 years, the world will need about $90 trillion in new infrastructure — most of it in developing and middle-income countries. Since the Paris Agreement, countries have been successfully growing their economies while reducing emissions, but not quickly enough. With additional financing and accelerated global support, the World Bank Group believes countries will be on track to meet their climate change targets by 2020. Infographic: The World Bank Group Climate Change Action Plan. View the full infographic. Over the last two years the Bank has committed billions to help countries meet their climate goals. 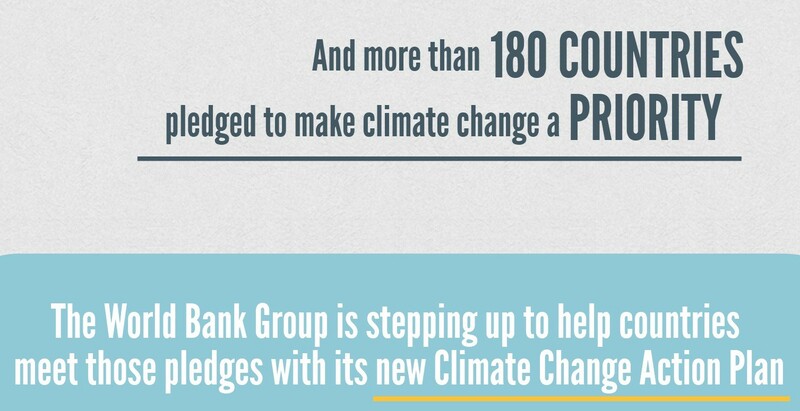 We will increase climate financing to 28 percent of the Bank Group’s portfolio by 2020. A new platform, Invest4Climate, launched by the Bank and United Nations, aims to crowd in private sector and other investors for high-impact opportunities in developing countries, such as. large-scale development of battery storage, electric cars, and energy-efficient air conditioning. The Bank has also been working with partners to support innovative climate-smart projects — from rapid transit in Senegal, geothermal energy in Indonesia, rooftop solar in India, and climate smart agriculture in Ghana and Ethiopia. 1. 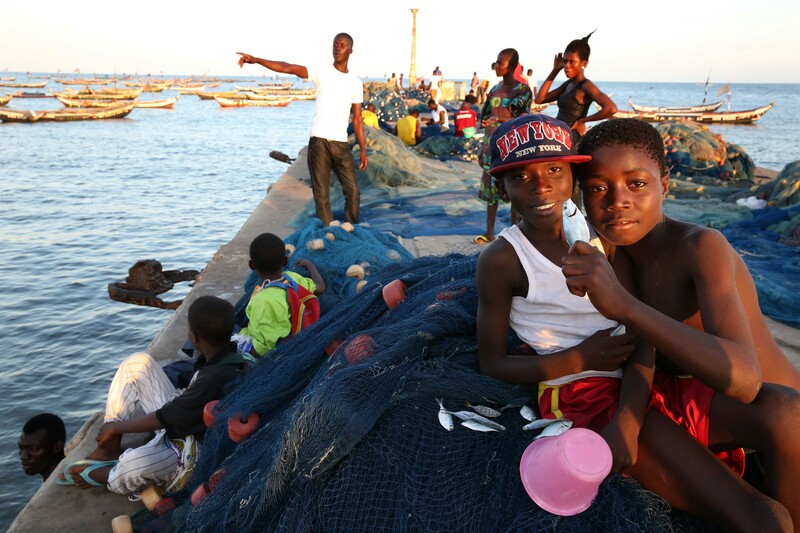 Resilient Coasts: Coastal erosion, flooding, and pollution threaten the livelihoods of over one-third of West Africa’s population. The West African Coastal Areas Management Program (WACA) investment platform will help up to 17 West African countries manage these risks by crowding in finance and technical solutions. 2. Climate Insurance: In the Philippines, we’re supporting a $100 million catastrophe risk insurance program to help 25 provinces manage disaster impacts. 3. Climate-Smart Agriculture: We’re working with the Cocoa and Forests Initiative in countries such as Ghana and Côte d’Ivoire to encourage more productive and sustainable cocoa production and end deforestation. 4. Resilient Cities: The City Resilience Program will help hundreds of cities around the world access finance so they can better manage disaster and climate risks. The first phase of the program starts with 30+ cities and is expected to scale to 500+ cities within 10 years. 5. Climate-Smart Mobility: We’re working with partners to develop a new intelligent transport system for Dakar, Senegal, aimed at moving 300,000 passengers per day while cutting emissions and promoting economic growth. 6. Forests and Landscapes: We’re supporting sustainable coffee production in Ethiopia through the Nespresso Sustainability Innovation Fund, training farmers and restoring degraded lands to revive local economies. 7. Hydromet: We’ve partnered with the World Meteorological Organization to modernize hydrological and meteorological services and systems across Africa to strengthen early warning and response systems. The first phase will invest about $600 million in 15 countries and four regional climate centers. 8. Green Bonds: The largest green-bond fund dedicated to emerging markets is expanding financing for climate-smart investments. 9. Carbon Pricing: Officially launched in Paris in December 2015, the Carbon Pricing Leadership Coalition (CPLC) is driving for effective carbon policies worldwide. As of 2017, the CPLC has more than 25 national and sub-national government partners, 150+ private sector partners from a range of regions and sectors, and 50+ strategic partners representing NGOs, business organizations, and universities. 10. Solar: The 750 MW Rewa Ultra Mega Solar Ltd. Project has brought record low solar prices to India and is expected to attract over $500 million in private investment. The project doubled the solar capacity of the state of Madhya Pradesh and is one of the largest single-site solar plants in the world. The energy generated will help power metropolitan rail transportation in New Delhi. 11. Geothermal: Shifting to geothermal energy will help Indonesia reduce greenhouse gas emissions and reduce its dependence on fossil fuels such as coal — its primary source of electricity production. With support from the World Bank and other partners, the government is planning a new Geothermal Risk Mitigation Facility to leverage several billion dollars in private sector funding for large-scale development. 12. Energy Efficiency: We’re partnering with Energy Efficiency Services Limited (EESL) in India to create sustainable markets for LED lights and energy efficient ceiling fans; facilitate investments in public street lighting; and foster new investment pipelines for super-efficient air conditioning and agricultural equipment. Learn more about what we’re doing and share your ideas here. Read more World Bank stories.